MVP Pilot: "The stat nerfs for ranged champions were the most critical. They’re too weak now." On the 12th of June (KST) in the 2018 LCK Summer Split Day 1, MVP defeated bbq Olivers 2-0. The highlight of the match was Game 1. MVP picked the Master Yi - Taric composition and bbq Olivers answered with Karthus - Nunu. MVP dominated Game 1 with Master Yi and also took Game 2 with the splendid performance of Ian’s Irelia. 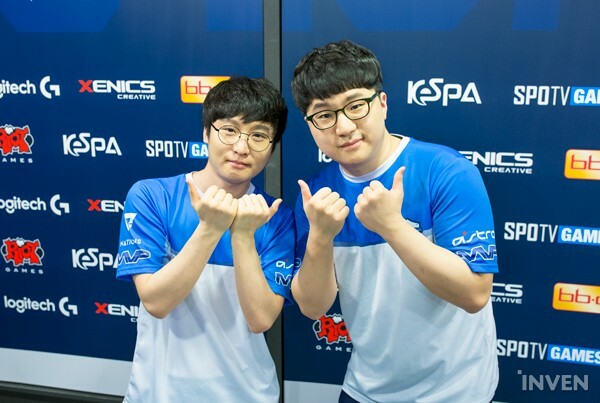 The following is the interview with MVP’s bottom duo, Na “Pilot” Woo-hyung and Jeong “Max” Jong-bin. Related: MVP Ian on Taric: "I didn’t become a mid laner to play this fatso champion." Q. You won the opening match. How do you feel? Max: We didn’t show everything that we prepared. I feel good because we won by showing only one strategy out of the eight prepared. Q. The draft was quite peculiar in Game 1. How did you prepare it? Pilot: We just trusted Master Yi. It was a composition that gave up everything for Master Yi. While we were playing, we thought that there’s no problem if Master Yi didn’t die. Max: Fiddlesticks was also a pick to help Master Yi. He has a good CC that the team was lacking. Q. This was the first match after you survived from relegation. How do you feel? Max: We weren’t quite aware that it was the first match after almost being relegated. We were always good against bbq but we weren’t careless. We just did our best preparing for the match like always. Q. We heard that the players were stressed out preparing the Summer Split. Many said that it was hard to decide which way to go. Pilot: At first, I played many ranged champions, but it was really difficult playing. But after I got used to it, it felt like a completely new game, so I’m having fun now. Q. Isn’t it too hard playing completely different champions? Some other ADC players are really complaining. Pilot: It’s alright for me because I know how to play many different champions. It’s rather fun for me. Q. What’s the biggest reason to the change? Pilot: The stat nerfs for ranged champions were the most critical. They’re too weak now. Regardless the level, being hit by a couple skillshots brings them down. They’re only good when they evade every single skill. Q. Then why did you play Lucian in Game 2? Pilot: I picked him because the opponent picked Ezreal. I was hit a lot during the laning phase in Game 1, so I really wanted to get back at him. Max: As soon as they locked in Rakan, I knew that they’ll pick a ranged champion. That’s why we were able to pick one too. Q. Some people said that the Karthus - Nunu composition is the counter pick against Master Yi - Taric. How do you think you won? Max: I think we won because our jungler is a maestro of Master Yi. And we don’t think Karthus - Nunu is the counter. It just depends on the performance. Also, I think Lulu was very important as well. Q. There are teams that rise significantly according to the meta. Do you think the current meta goes well with MVP? Max: I think we do have some parts that go well with the meta, but I think how the other teams adapt will be more important. Q. Some are saying that the teams with 10-man-rosters are advantageous in the current meta. Max: I think Afreeca Freecs are getting the highest expectations because they’re already very used to the 10-man-roster. Most teams are also trying to expand the roster to 10 people too. Q. Which team do you think will be strong this season? Max: Many say that Afreeca is really strong, but I really don’t know. In this situation, nobody can really predict.